One of the many stories that I wasn't able to post about last week involved a police chase that ended badly - at least for the suspect - along the southbound Southfield Freeway Service Drive, just north of Paul. 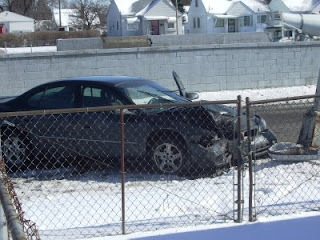 It was shortly after 2:30 in the afternoon, a week ago Monday, when the black Pontiac Grand Am pictured below led Detroit police officers on a high-speed chase that ended when the officers bumped the suspect car causing it to crash into a light pole. Thankfully there were no injuries in this matter. The suspect in question was immediately taken into custody by police. He did not appear to be injured when I saw him in the back of a police cruiser that afternoon. The light pole that was hit in this crash was severely damaged. This, of course, is evidenced by the fact that the light is on the ground in the photo above. A week later, this pole still has not been repaired by the Detroit Public Lighting Department. It continues to lean at a 70 degree angle. It's moments like these that cause me to remind everyone that it's really not a good idea to run away from the police. Just pull over and get a good lawyer, if you need one.